All material we use is of high quality.Artwork is printed at high resolution with vivid color on thick high quality canvas to create the look and feel of the original nature and masterpiece. Canvas paintings are wrapped and stretched on durable wooden frame, ready to hang. Beautify your home with the well-designed and elegant piece.We seriously check every items before shipment.Best service, most reasonable price and sincerity for customers. 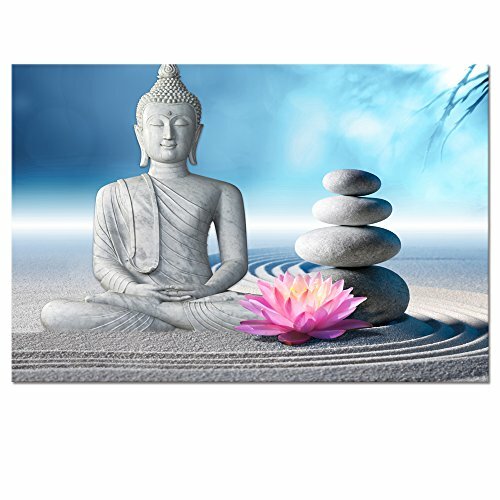 Buddha Canvas Wall Art,Giclee artwork,Eco-ink resolution, printed on water-proof canvas.A great gift idea for your relatives and friends. Stretched and Framed, Ready to Hang.Gallery wrapped on 1.1" wood bars,WHY NEED TO CHOOSE THICK FRAME?More Strong Threedimensional Appeal,More Stable,and Better Quality. Size:24"x32"(80x120cm),XXlarge Canvas Prints,Ready to Hang. Mirror edge continues to the sides.Nail and Mini Level attached, Plastic film Shrank Warp Protect Canvas,Card Corner Protection,Packed in Strong Carton.One more GOOD DESIGN is water-proof flannel on back protect the staple avoid rusting. VISUAL ART Guarantee Quality and 30 days full refund offered.Any problems,please feel free to contact us,we treasure your purchase experience much.And due to different brand of monitors, actual wall art colors may be slightly different from the product image. Rivet Turquoise Blue Mandala Canvas Print, 24" x 24"